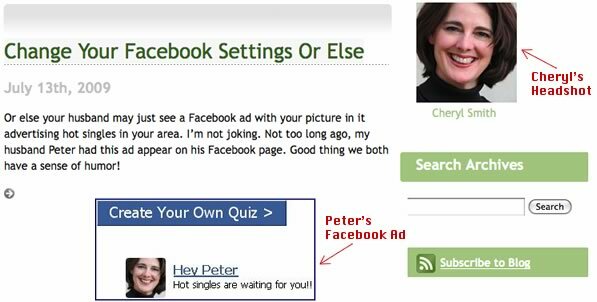 Take for example, Peter Smith, who was recently presented an ad on Facebook aiming to connect him with Hot Singles and the image of the hot single was his own wife. No, she hadn’t left her status as single and no she hadn’t signed up for Match.com or similar. Cheryl, like the hundreds of millions of other Facebook users had no idea of a setting that Facebook defaults to true allowing your picture to be used in your friends’ Facebook ads. Thanks, Facebook, for reminding me again why I have no use for your borderline-ethical services. I had no idea they were doing this! I’m changing mine now, thanks for the fyi. No problem, but I will venture to guess that your husband is still yet-to-be a Facebook subscriber like myself; thus automatically taking him out of the running for dates with his own wife.